St. Elmo Lee fought at the Battle of Leyte. U.S. howitzer fires on Catmon Hill, Leyte, Phillipines. October 20, 1944.St. Elmo Lee, of Ray City, GA participated in the Battle of Leyte with the 902nd Field Artillery Battalion. In November 1944 the 902nd provided artillery support for the 77th Division operations in the Battle of Leyte. 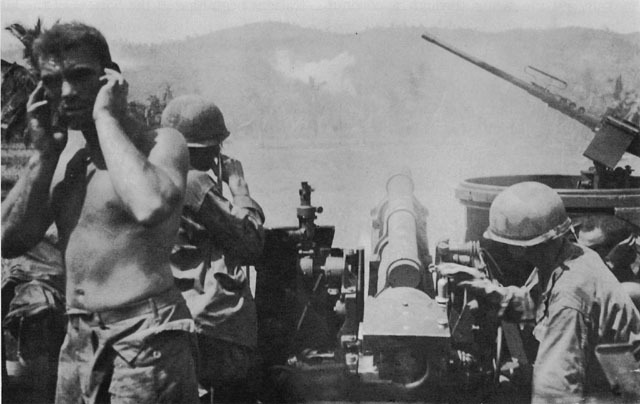 U.S. howitzer fires on Catmon Hill, Leyte, Phillipines. October 20, 1944.